BSG Financial Group, a leading provider of revenue-enhancement programs and compliance solutions for financial institutions nationwide, will present a webinar on Tuesday, June 27 at 11 a.m. EST entitled, "Rethinking CD Sales in a Rising Rate Environment." The free webinar—which is part of an ongoing educational series that the company provides for its clients and potential customers—will offer guidance to community institutions about time deposit management during this period of rising interest rates. 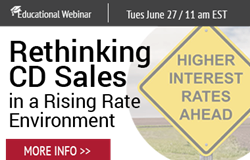 BSG Financial Group is hosting this webinar in response to the Federal Reserve’s recent interest rate hike on June 14, 2017–the third increase since December, 2016. These rate hikes represent an increase in the cost of wholesale funding and may signal difficulty in attracting and retaining interest bearing deposits. The webinar will help financial institutions prepare for this changing landscape and analyze the need for a new approach to managing the CD to ensure compliance and a healthy balance sheet. The CorePoint was launched in 2010 – built by bankers for bankers – and is located out of Omaha, NE. The CorePoint offers a combined approach through strategic and patented processes, frontline training, and a unique technology platform. The company now serves financial institutions across the country and is invited to present at local and national conventions as the expert in CD management and sales. For more information about the company, visit http://www.bank-ps.com.